Brighton artist Fred Pipes has created Art Deco paintings of local landmarks to spruce up the former Astoria cinema site in Gloucester Place. 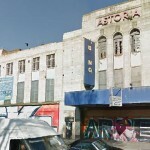 The artworks feature local landmarks in the retro-style of 1930s posters and include an image of the Astoria cinema, specially drawn for this display. Other images on the building include Shoreham Airport, Embassy Court and the Seven Sisters. Artist Fred Pipes said: “I was very flattered when the council asked me to help with this project, particularly as the paintings fit so well with the Astoria’s history. Councillor Dee Simson, Brighton & Hove’s cabinet member for community affairs, said: “These gorgeous paintings really brighten up the place whilst also linking back to the building’s heyday in the thirties. Brighton autism charity Assert wins "volunteer group MBE"